The chief seat of the family was Allardice castle, which sits picturesquely on a dramatic, wooded and terraced rock spur protruding above the flood plain forming the floor of the deep valley of the Bervie Water about two miles north west of the Royal Burgh of Inverbervie. The castle is remarkable and unusual for its extraordinary development of the prolific and intricate label moldings supporting the turreted spiral staircases accessing the cap house or watch chamber and upper floors and which are massively corbelled out from the main walls. Since 1542 the time at which the current L-plan building was built many alterations and changes have been made to the original structure to the extent that the original plan form is only recognizable in part. The most original part of the building with its very thick walls runs from north to east and externally is the more ornate part of the structure with the west wing, which was built in 1762, being a more refined structure with thinner walls, larger windows and a large circular turret rising through three floors located at the west-most corner of the building. 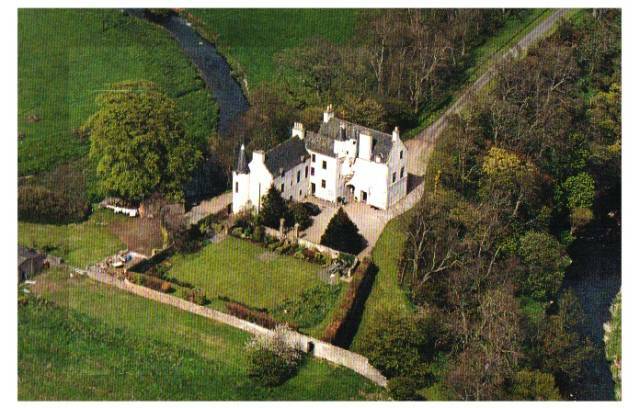 The castle has been extensively restored since 1971 by the current owner, an architect, Mr. William Cowie. The property is not open to the public. A more detailed description and photographs of the castle are available on www.allerdice.net .